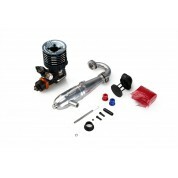 Ultimate Racing Il y a 4 produits. M-5 Engine Specifications:Diplacement: 3.49cc.R.P.M. (max power): 34.000 RPMPractical range: 6.000-36.200 RPMTransfer Ports: 5Rear Ball Bearing Type: 25.8mm SteelCrankshaft Type: 14mm – turbo - tunedGlowplug Type: Turbo - C6TGC Livré avec embrayage, coude reso, flitre a aire, ressort reso.